Le Fiscalou, naturist campsite in Puycelsi, France. Review. Le Fiscalou, naturist campsite in Puycelsi, Tarn, France. Independent review. A quiet and well maintained naturist campsite in a beautiful setting. For us is Le Fiscalou a perfect holiday destination. The campsite is run by a Dutch couple. When you arrive they will welcome you with a drink. That feels good. The campground is not large. The sites are beautiful. There is possibility to rent a caravan, chalets and cottages. The campsite is an ideal starting point for walks or bike rides. We see every day a lot of cyclists go on tour. The temperature in this area is almost the entire summer around thirty degrees. Please realize that it might be cold in the evenings in September. This year we wanted once again to this campsite. We have chosen for September and we have, because of the weather, rented a chalet. The price is very reasonable. Actually, I do not even spend much more than a tent instead. The chalets are incidentally also for sale. At the campsite you feel the nature around you. You get there the special feeling of naturism. At the campsite you are able to make a nice walk through the forest round the campsite. And naked!! At the campsite is a small but nice pool. Furthermore a bowling alley and volleyball court. Barbecue and a sandbox for children. There is no shop, but you can order bread. The simple but cozy restaurant offers regularly organized group meals. Friday BBQ all together! We did our shopping in the supermarket of Monclar-de-Quercy. About 9 km riding. A dreamy town that does not have much to offer. If you are with teenagers know that there is not much or better nothing to experience. The area is a strong rolling landscape and more than beautiful. It reminds us of the Ardennes in Belgium. Very quiet otherwise. When you want to visit all sorts of villages then we would prefer the Dordogne. Nice excursions from there to Saint-Antonin-Noble-Val. On Sunday a large regional market. A small town on a mountain, called Cordes sur Ciel. The red city on the river Tarn, Albi. We also went once to Toulouse, not really a must. Beautiful central square, but with too much traffic. And the rest? Ah yes, a big city. Albi is a nice shopping center. Beautiful and elegant shops and many terraces. If you go to Albi do not forget to visit Cathedrale Sainte-Cecile. This cathedral is one of the few churches whose interior still looks like around the year 1500. Next to the cathedral you will find Le Palais de la Berbie, where the Museum Toulouse-Lautrec, recently renovated, is located. 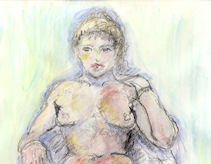 This famous artist, born in Albi, who lived around 1890 and worked in Paris. The palace is still owned by the noble family Lautrec. Imagine yourself back in time in the museum that was founded in 1922, by a cousin and a friend of Henri de Toulouse-Lautrec. Comfortable and cozy small campsite. Special with children. Very clean bathrooms. Particularly nice owners. Good and tasty food and a beautiful setting! We also have our vacation spent at Le Fiscalou and basically everything was perfect. We came for our peace and to see the area. Both were successful. Especially with the information that Sylvia gave us upon arrival at the campsite. We will come back here because we have to visit other parts of the aerea. A warm welcome and pleasant explanation about camping and surroundings with lots of leaflets. Fine casual atmosphere, very nice pool, very clean bathrooms and excellent meals. The towns and surroundings + views are the most beautiful in France. We had a wonderful holiday at camping Fiscalou with our two dogs.